Peel and cut the potato into cubes and place in a pot of boiling water. Cook for 15 – 20 mins until softened. Drain and set aside. Using a food processor or blender, blend the corn into paste. Reserve a handful corn for later. Place corn, potato and seasoning ingredients in a large bowl and mash them together. Give it a taste and adjust with more seasoning if required. Add the chopped vegetable and flour into the corn mixture and mix well. Refrigerate for 15 – 30 mins to firm up. Using a spoon, scoop out a portion of the corn mixture and lightly roll into a ball or log shape. 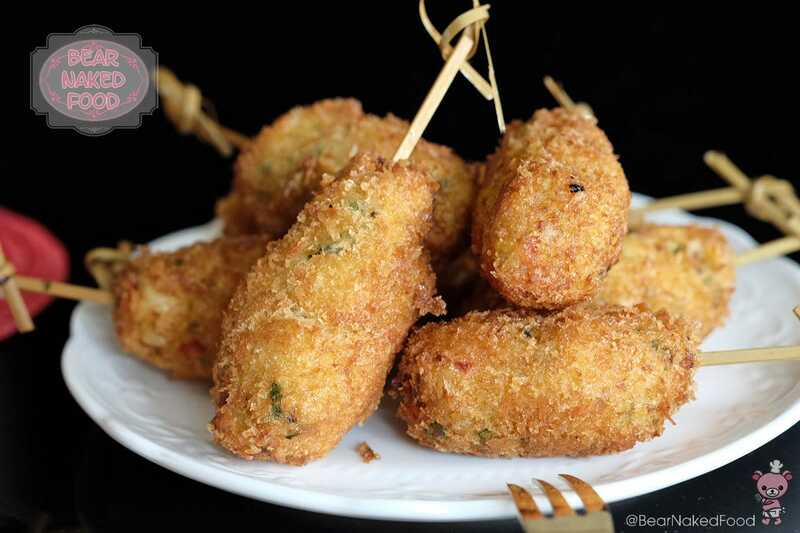 Stick a short skewer into the centre and roll it in the beaten eggs, follow by panko breadcrumbs. *you could omit the skewer if unavailable. Heat a pot of oil, covering ¼ from the base. To test the oil temperature, insert a wooden chopstick in the centre of the pot and if small bubbles start to form around the chopstick, the oil is ready. Place a few pieces of the corn cakes into the hot oil and fry until golden brown.